This is a “surplus copy” of the original 100-copy slipcased edition of Lorelei of the Red Mist and is signed by the author of the introduction, Harry Turtledove, on a Frank Kelly Freas-illustrated limitation sheet (marked “P/C”) and housed in a matching Black Arrestox cloth-covered slipcase. 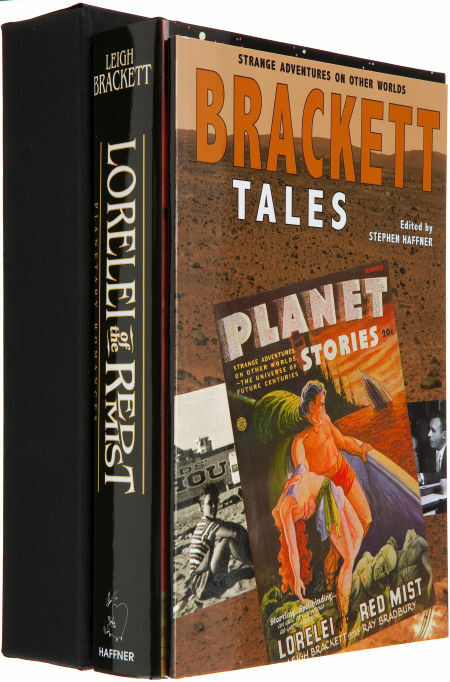 This edition is also an extra special treat for admirers of both Leigh Brackett and Ray Bradbury: housed in the slipcase is a 70-page chapbook, BRACKETT TALES! 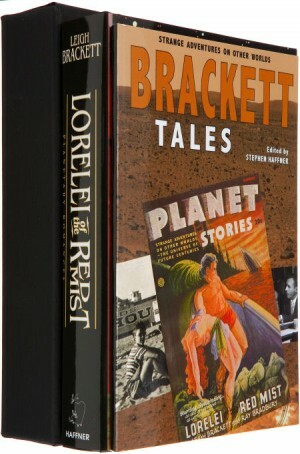 Internally formatted to mimic the design of the original Planet Stories pulp magazine, BRACKETT TALES is chock full of vintage goodies, including a facsimile reprint of “Lorelei of the Red Mist” from its first appearance in 1946. Thanks to the efforts of Bradbury collector/archivist, Donn Albright, two rare fanzine works (one short story and one essay) of Brackett have been supplemented by personal correspondence between Bradbury and Brackett from the early 40s through the 1970s. Donn also provided images of books inscribed by Bradbury to Leigh Brackett and Edmond Hamilton.